The Digital Print interclub competition has been held as part of the NCPS Annual Exhibition from 1999. But the trophy came later. Alan Adshead was a popular member of NCPS until his untimely death following a climbing accident at Easter 2000. 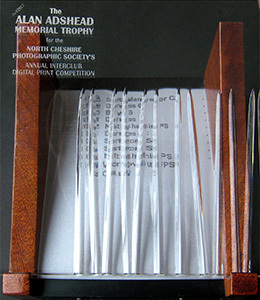 His daughter Jill donated to NCPS a unique contoured glass plaque, engraved with the words “The Alan Adshead Memorial Trophy for the North Cheshire Photographic Society’s Annual Interclub Digital Print Competition”, and personally presented it for the first time to the winner of the 2004 Digital Print competition. Alan Bromage designed and produced in 2005 a wooden plinth for the Trophy which can incorporate a certificate of all the competition winners. This is updated after each competition and a copy supplied to the winners.